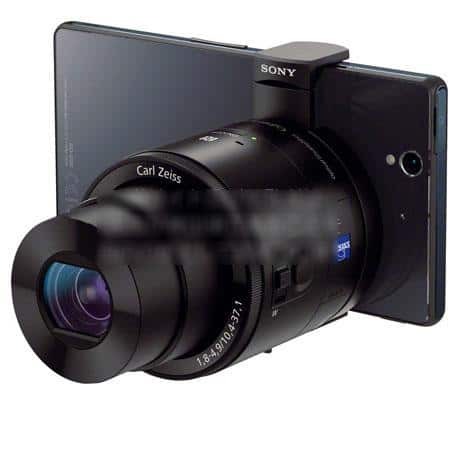 Sony's external QX-10 and QX-100 camera lenses for smart phones leaked out some time ago, but we never knew exactly how they worked with non-Sony smartphones until now. Just in the last few days we found out that Sony will be shipping two new cameras called the QX-10 Smartshot and the QX-100 Smartshot. These cameras aren't the center of attention though, rather the lenses themselves are. In pictures past we've seen that the lens itself it fastened to any one of the new Sony smartphones, be it Xperia Z1, Xperia Z Ultra or otherwise, by a little bracket. This bracket seemed like it would be pretty universal, but apparently it's going to be a separate item from the lenses themselves, so buying a lense won't come with these brackets. Rather you will be buying a bracket made specifically for your smartphone of choice. Obviously not every smartphone out there will be supported, so you'd better be carrying something Sony thinks is important. The other images shown off above help paint a picture of how these new lenses can be used, outside of obvious purposes of course. Besides giving much better picture quality over what your phone can provide, these new lenses work via Bluetooth, and can be placed anywhere you want in order to line up that shot just right. You'll be using your phone as a remote to take the picture, which is a lot easier than trying to hit that awkwardly placed button while holding the phone backwards, especially with a giant lens tacked on to the phone to make it more off-balance. Sony will be officially introducing us to the QX-10 and QX-100 on September 4th at 4pm London Time, so be sure to check it out when we bring it to you. In the mean time we've got a couple of pictures of the two new lenses in various angles and with the bracket on or off, as well as the carrying case Sony will have for either of them. These images were obtained from Photo Rumors, and apparently the original images had some anti-Japanese writing on the middle of them, so they've been blurred out to protect those innocent eyes of yours.